FALL 2015 - Jing Williams, Ph.D.
Over the years, American men and women have served in the Armed Forces in times of war and peace. This writing contest is designed to promote student awareness of veterans' sacrifices and contributions to our society. 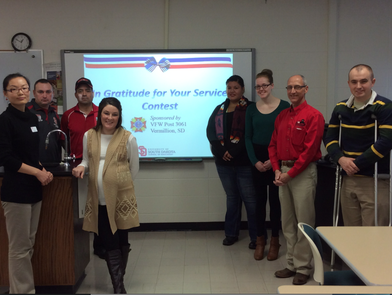 This contest was initiated and organized by Jing Williams, sponsored by the Vermillion Veterans of Foreign Wars post 3061, and supported by the School of Education and the ROTC program at the University of South Dakota.